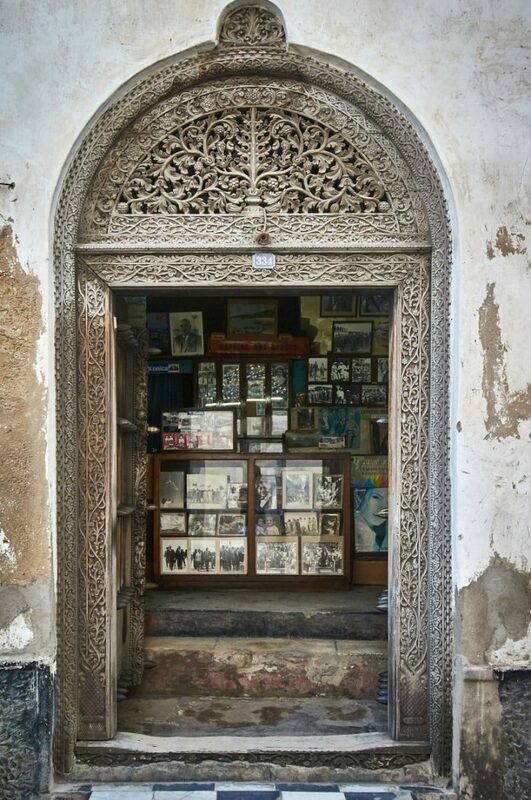 When you say Stone Town a few key words come to your mind: colonial past, the slave trade, spices, doors carved in precious wood essences, and, obviously, Freddie Mercury (yes, he was born here, if you did not know). 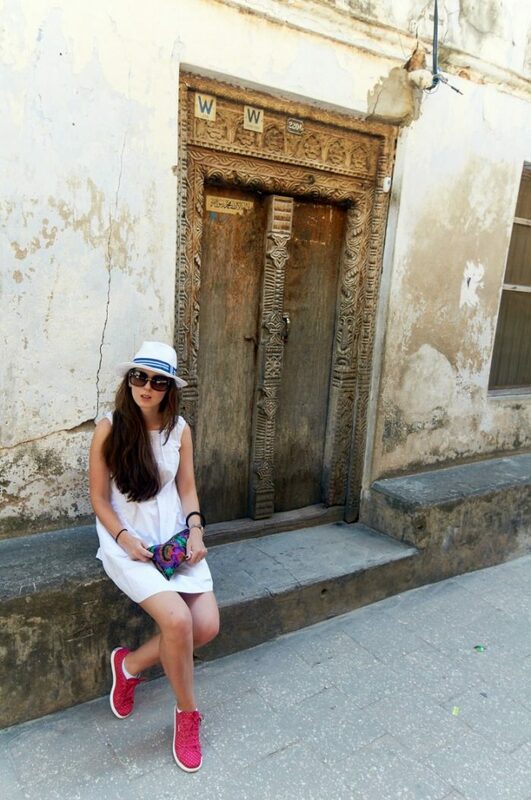 As my holiday in Zanzibar ended right in the capital Stone Town, I spent half a day wandering its labyrinthine streets and visiting some of the attractions that one should not miss, once in the city. 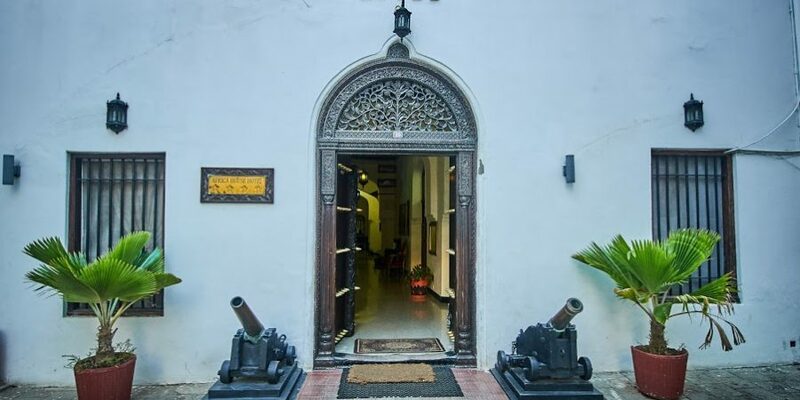 Once upon a time, Stone Town was the pearl of East Africa, a city built in the 19th century from the spice trade, but mostly from the slave trade. 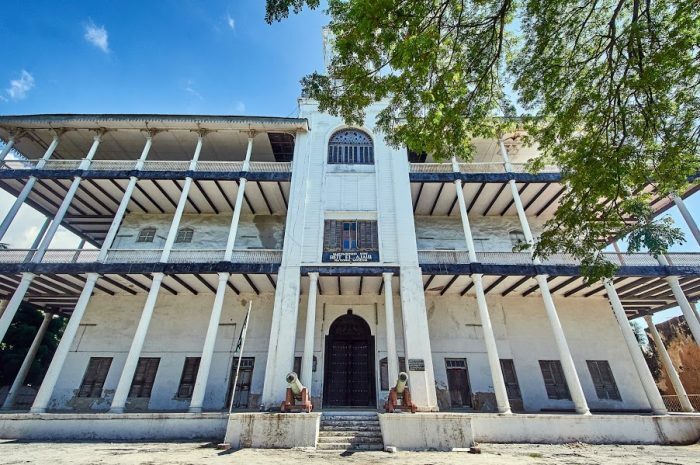 Very sad pages in the troubled history of slavery were written here, in Stone Town, and the slave market, which can still be visited, keeps the traces of more than a thousand years of horrors that occurred here. It’s a short tour of nearly 20 minutes that takes you back in the past, in a dark and shameful period of mankind. There’s nothing extraordinary to see and mostly nothing that the human species should ever be proud of. On the contrary. Labyrinthine paths carved into coral stone lead you to the so-called “rooms” where slaves were kept before being traded. Men and children alike were locked in these rooms, a few square meters big, with hands and feet chained and stacked one upon another, without access to toilet and especially without the chance of seeing the light of the day. Some rock-cut niches assured the required air in order not to die suffocated. However, many of them died in such inhuman conditions and their stay in the basements was seen as a test of endurance. Only the strongest came out alive, and that made their price on the slave market grow. Hard to describe in words the sadness that one feels thinking about these innocent people kidnapped from the bosom of their families on the African continent and transported to Zanzibar, like animals. 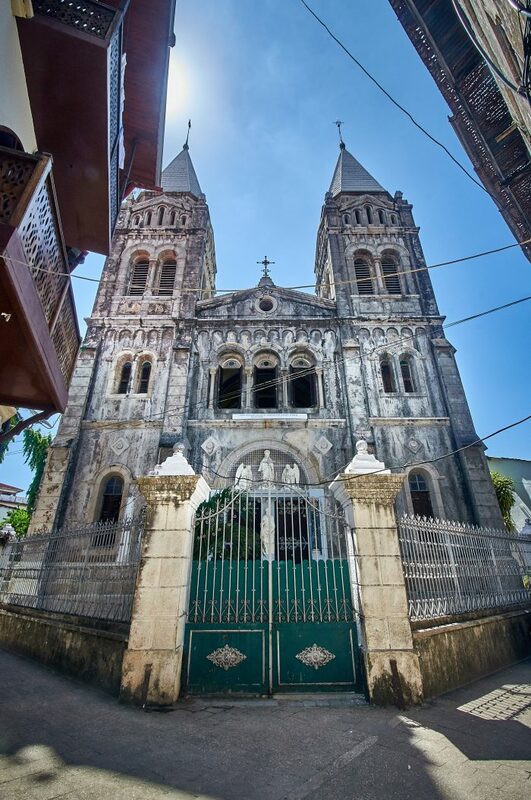 The Anglican Cathedral “Christ Church” was built starting 1873 over much of the Slave Market. 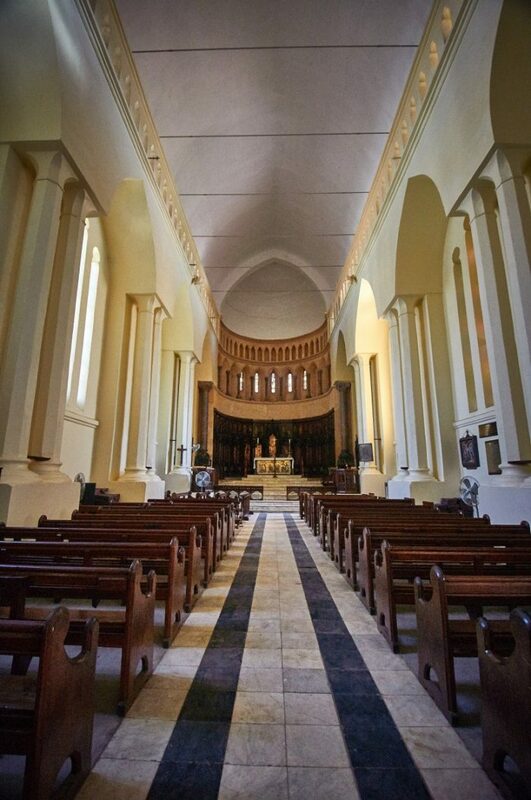 The construction was the initiative of the Bishop Edward Steere and was dedicated to the ending of the slave trade. It lasted 10 years. The altar overlaps the “stage” where the slaves were brought to be whipped, and the reddish marble floor reminds of the bloody episodes that provided “fun” for those who attended such atrocities.The tour ends in front of the Slave Monument, erected in 1998 in front of the cathedral, work of the artist Clara Sornas. The statue depicts a group of slaves in a pit, chained by the neck. The houses collapsed, yet their doors stood behind! The Slave Market’s image remains vivid in your mind long after you leave the place. Only the buzz of the streets, the hectic traffic, the winding corridors and the smells that strike you everywhere manage to bring you back to present days. 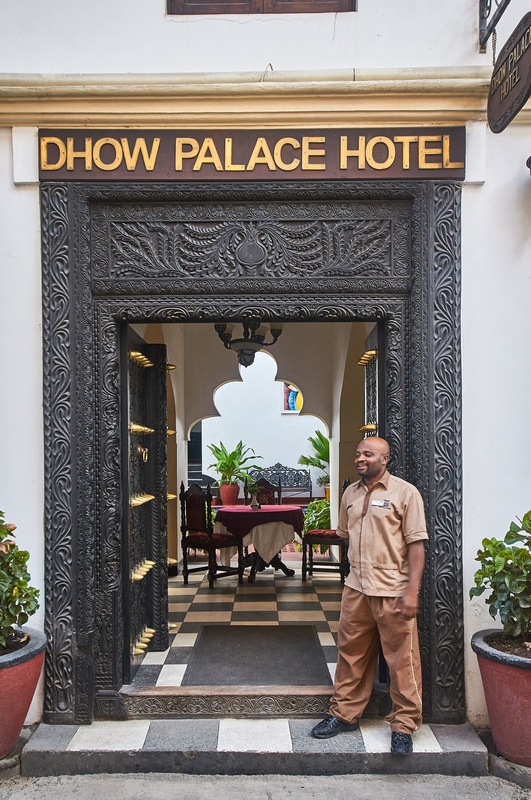 As the name implies, Stone Town was built of stone, specifically coral stone and, as the capital of the former Sultanate of Zanzibar, it managed to join the list of the most important cultural and artistic cities of Eastern Africa. 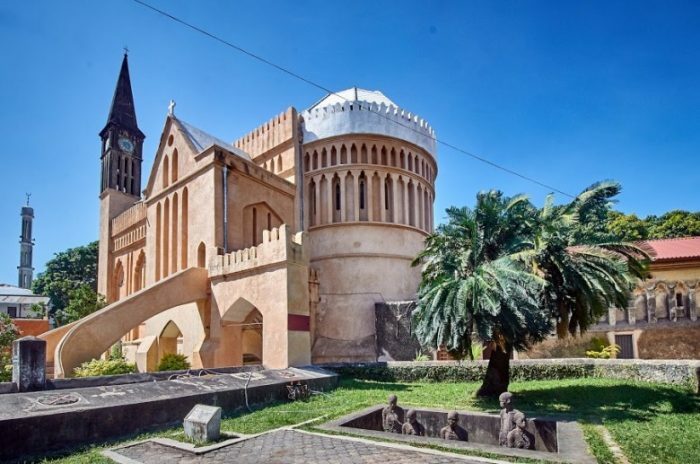 An extraordinary mix of cultures has met in this town that once abounded in houses and monuments of Arabic, African, Indian, Persian and European inspiration. As a result, in 2000 UNESCO decided to enroll Stone Town on the list of cities that are part of the Heritage of Humanity. 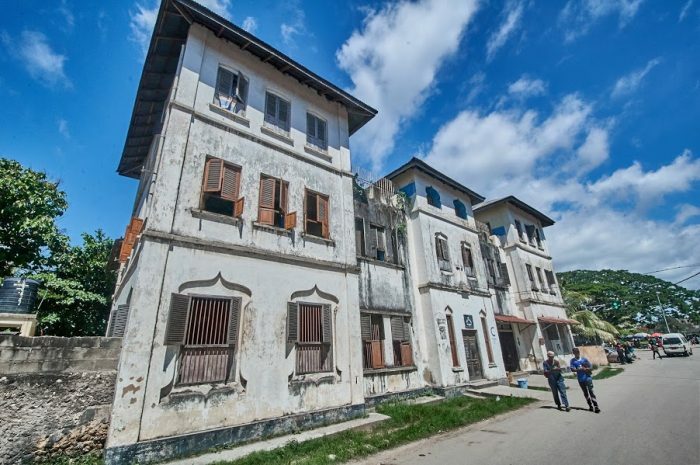 But today, the jewel of East Africa is down on its knees; it has turned into a city where hundreds of houses and monuments either collapsed or are to be found in an advanced stage of dilapidation, awaiting restoration. 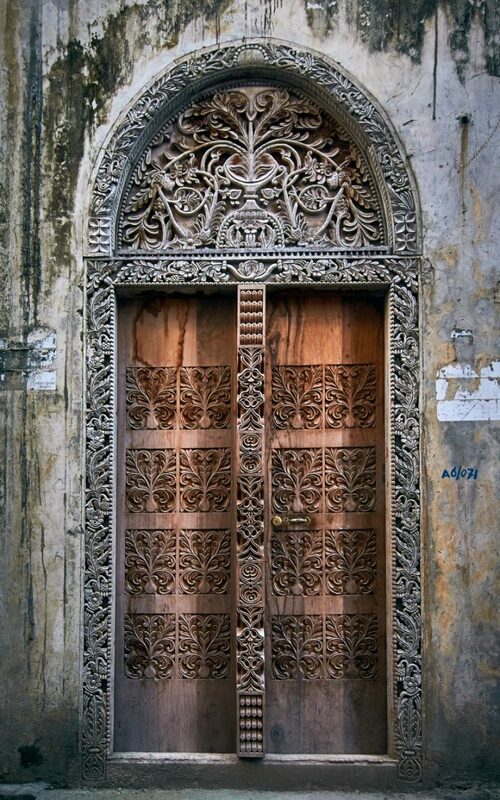 Only through their massive doors, carved in precious essences, can you still glimpse the grandeur of bygone times. Dozens of winding streets of the souk captivate you with their colors and noises. You lose their order, even with the city map in hand, and you get to tangle and untangle yourself in a fascination that only the Arab world can exert to such an intense level. Among the old walls, you can spot women covered with black scarves or who wear long colorful dresses, children who jump in front of you while chasing a deflated ball, many curious eyes staring at you from behind any open window, or clusters of men discussing the political issues of the day, while they enjoy a tea or share generously a narghile. The latter are the most numerous groups. Sometimes they take a break from their talks to measure you from head to toe. Then, once you’re out of their sight, the talks are resumed with the same intensity and the same range of sounds that often create a feeling of strife. On these narrow and squalid streets unfolds the daily life: clothing workshops with sewing machines in the street, butchery shops devoid of any trace of hygiene, stalls with fruit and vegetables, everything at a glance! Some people sell their goods, others cook, paint or others simply sleep on chairs or armchairs comfortably installed in the front doors. The old Stone Town is a ruin. Rumor has it that only 13% of the houses in the city are in a good state. In total, there are about 1,700, of which about 1,300 have important historical value. Some were bought by various hotel chains and restaurants, and currently accommodate the curious tourists who come to see beyond the dreamy beaches of the island. Others, however, are heedlessly abandoned. Time passed ruthlessly over their walls but appears to have been more lenient with their doors. 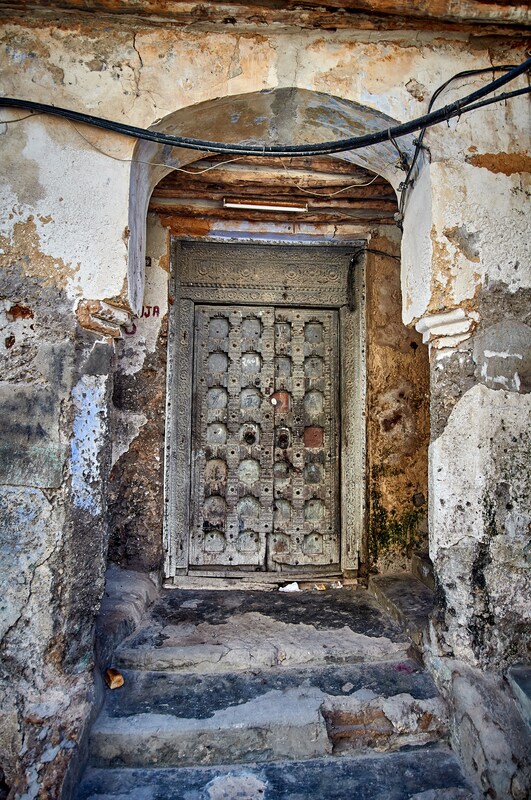 If in 1980 it was estimated that in the city there were around 800 doors, now their number has fallen sharply, largely due to trafficking with patrimony goods. 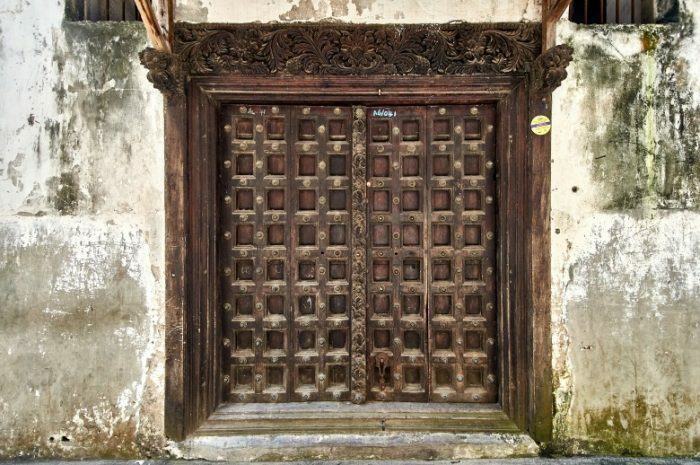 Countless photographers stroll through Stone Town to capture these wonders. It’s impossible to overlook their beauty and not think that once were painstakingly crafted by skilled artisans. 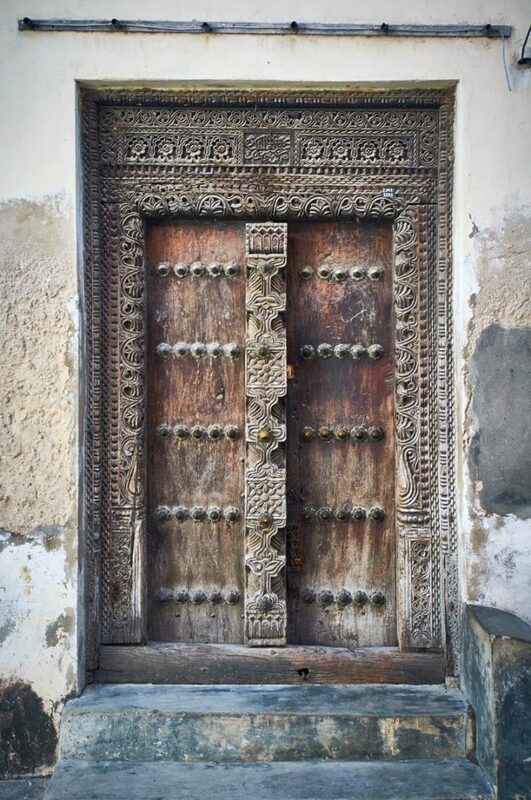 Two types of doors are to be noted in Stone Town: the Indian doors, easily recognizable by their rectangular shape and ornaments with massive brass spikes and the Arabic doors (Omani), either with rectangular or semicircular top and inscriptions in Arabic. The giant metal spikes in the design of the door had a functional role in India, which served to stop the attacks of the elephants. 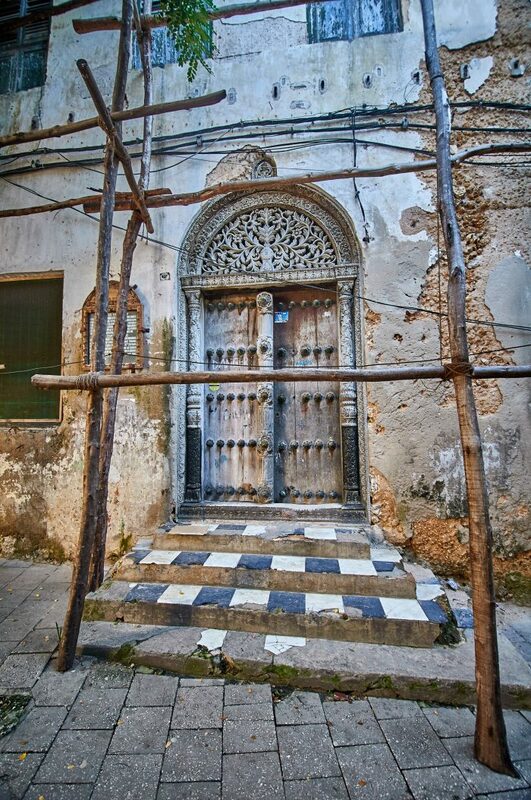 In Zanzibar, however, their role was purely ornamental. I admired and photographed every door we came across. We found some lacquered, wearing proudly a hotel logo. Most of them, however, I found tired, dusty, with rusty spikes or simply latched with massive chains. Some of them won’t be perhaps reopened again. And others will always remain open to the past, keeping alive the memory of the slaves who once made blossom a Stone Town. Sehr interessant und sehr gut geschrieben. Herzlichen Glückwunsch! Next Post It’s teatime in Sri Lanka!